The Holocaust is one of the most daunting and disturbing historical time periods to portray on film, not only for its harrowing personal experiences but also for its historical ramifications and the systematic eradication of those considered inferior by Nazi Germany. These films can easily fall prey to criticism, especially when made under the guise of a Hollywood system that often dramatizes events for cinematic purposes. However, the importance of the event to human history, as both a lesson in the lengths of hatred and a cautionary tale for the future, has produced a differing cadre of films that have told stories of various people and their singular experiences. And yet, these many films are only a sliver of the differing experiences from those that survived the Holocaust. These films can’t fully attest to the many individual experiences, as the scope of the Holocaust is extensive and personal. On the other hand, for every story of survival, there is the silence of the millions that are unable to testify to the atrocities of war. There have been many Holocaust films since the end of World War II, and even 70 years later, its impact has failed to dissipate. Within these films there have been varying perspectives and experiences that recollect a piece of the larger picture. What follows is a look at some of the ways film has remembered the Holocaust through different narrative strands. Some are fictional, while others are based on true accounts; nevertheless, there is a story in each one that alludes to the magnitude of the Holocaust and the essential need to always remember. “Son of Saul,” a powerful and harrowing Holocaust drama from Hungary, is tightly focused on its protagonist, Saul Auslander (Geza Rohrig), a Hungarian-Jewish Sonderkommando responsible for cremating the dead bodies of Jews in Auschwitz. 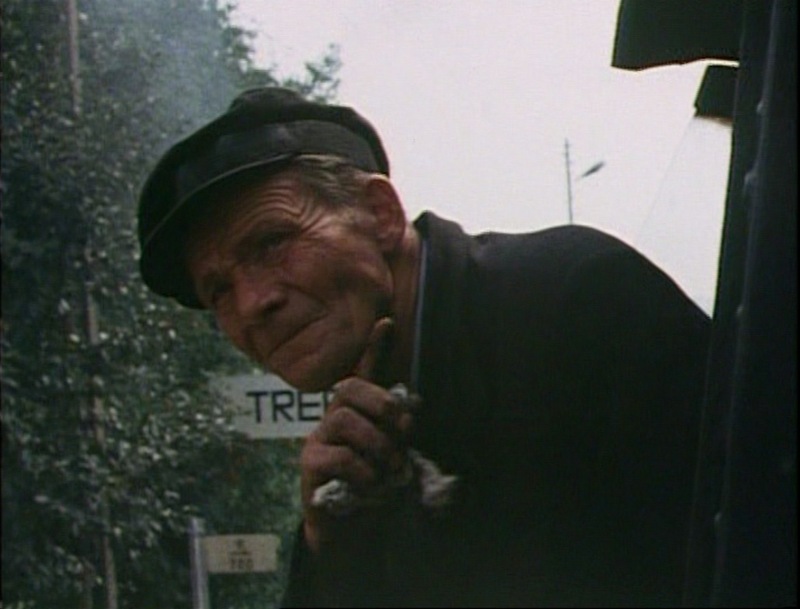 By choosing to shoot the film in close-up, director Laszlo Nemes focuses singularly on one man’s moral crisis, while blurring and effacing a narrative tendency for melodrama by eschewing conventional dramatic and filmic techniques. The film, shot almost entirely up close on the face of Saul, evokes a sense of personal conflict and experience, leaving much to the imagination. Through the use of sound — from roaring flames to the pained distress of victims — the film allows the audience to reflect on the experience through a singular perspective, downsizing the scope of other Holocaust films down to one man’s conflict and hopelessness, avoiding a grandiose scope while creating one all the same. 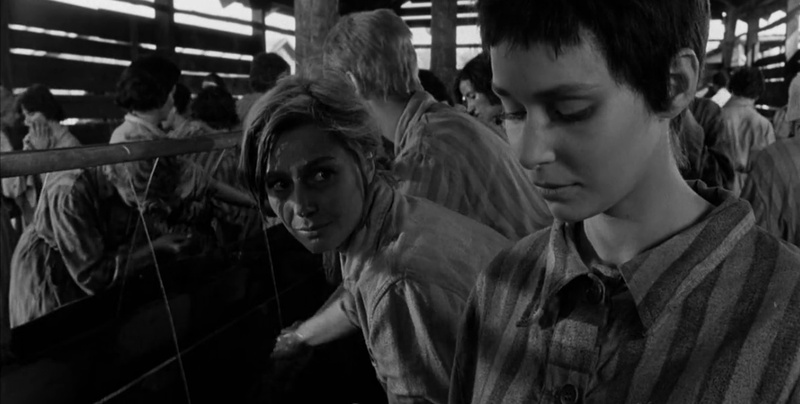 Ultimately, we are left with a minimal visual experience, restricted by its 4:3 aspect ratio, allowing the mind to fill in the gaps of the horrors of Auschwitz and the film’s protagonist. “Night and Fog” is a half-hour essayistic short documentary from French director Alain Resnais and one of the earliest documentary films to show some of the atrocities of the camps. Short in length but substantial in its agonizing images of concentration camps, the film presents the Holocaust as a circular perpetuity likely to occur again. 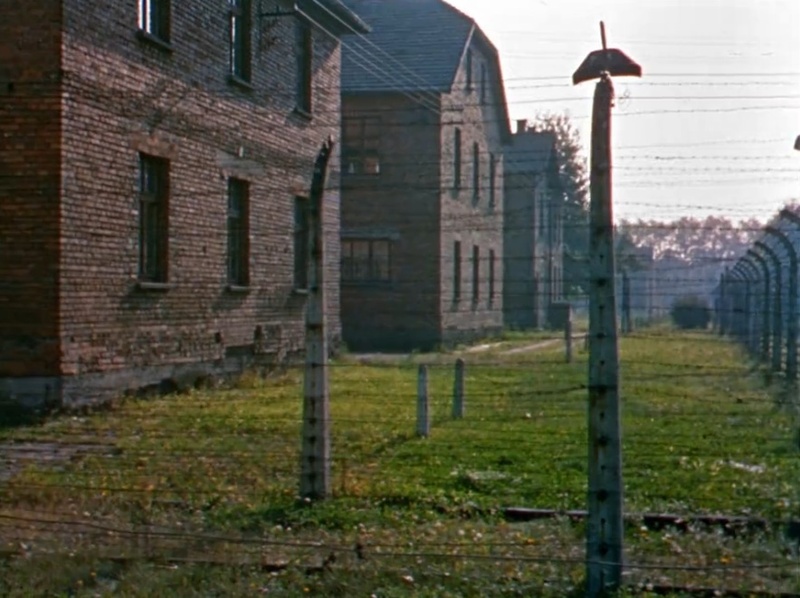 The film begins with placid color images of an abandoned present-day concentration camp harboring a silent and hidden history under the natural wild growth of grass. The archival black-and-white images of the camp juxtaposes the present as a reminder of the past, which is occupied by decimated bodies of Jewish prisoners and a sense of lingering death. The green pastures overcoming the man-made structures serve as a metaphor for the limited memory of humanity. The film becomes bleaker as it marches down the destructiveness of intolerance. The bodies pile on and the pressure to admit and take responsibility of the atrocities becomes heavier and incisive on the viewer. The film reduces what happened in the camps to a visual essay on violence and intolerance, more concrete and palpable because the images can’t fully depict the scope of the Holocaust, as the narrator grimly states. However, it is also a warning and reminder of what humanity is capable of; its shocking images still hold the same power they did 60 years ago. Resnais is only capable of allowing his audience a glimpse of the Nazi’s anti-Semitic agenda, anything more would render the subject unfathomable to the viewer. Gillo Pontecorvo’s 1959 “Kapo” follows a 16 year-old girl who loses everything she had, including her identity as a Jewish girl named Edith, literally going as far as to lose all faith. Avoiding the fate of many Jewish prisoners by shedding her Jewish heritage, Pontecorvo allows for a restricted view of the camps that effaces any trace of Edith’s Jewish heritage. Edith is given the identity of Nicole Niepas and placed in a criminal camp, not just losing her belief system, but also her womanhood as well. As her character loses her humanity and becomes detached from her fellow prisoners, she inherits the role of Kapo, conflicted by the moral dilemma of survival. Her transformation is complete as she becomes like her captors, a forced extension of the Nazis with her Jewish heritage almost completely absent, almost never mentioned in the rest of the film. By placing 16-year-old Edith at the fore of this story, the film manages to evoke a sense of loss, as we witness innocence disappearing in front of our very eyes. Not only is her Jewishness erased in the film, but for the audience it is merely a memory of the past, completely unretrievable. 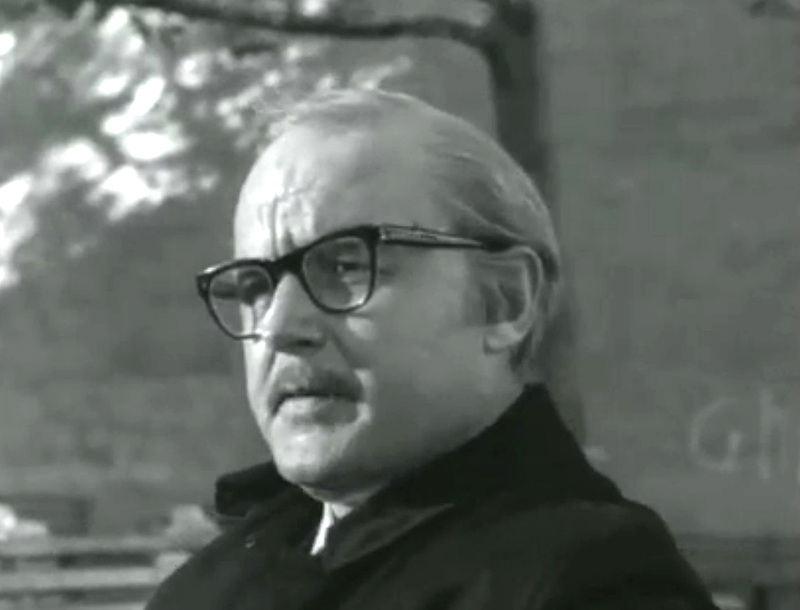 In “The Pawnbroker,” protagonist Sol Nazerman (Rod Steiger) is a curmudgeon pawnbroker who attempts to adjust to a normal life in New York City as a bitter Holocaust survivor unable to relate with others. Working under him is Jesus Ortiz (Jaime Sanchez), and an obvious tension between both progressively grows, ultimately leading to violence. Trapped behind his metal cage in the pawnshop in his own personal prison, even two decades after the liberation of the camps, Nazerman desperately suppresses memories of his past in an attempt to move forward, and he illustrates the lingering power of the Holocaust. Ironically, in his suppression, Nazerman is unable to move from the past as it continues to rear through his conscience, triggered by the world around him. Director Sidney Lumet intermittently injects the film with flashes of Nazerman’s concentration camp imprisonment, which, though vague at first, crafts a larger picture as the film’s narrative unfolds. Nazerman’s flashes of memories grow in length and crushing oppressiveness until they become unavoidable and are forcefully realized by Nazerman and the audience. As we experience the root of his personal torture and guilt, the images are of Nazerman’s personal experiences and encompass only what he laments, which is the guilt of his survival. Not only is Nazerman troubled by remembering his experience in the camp, but the unearthing and catharsis of revelation he experiences is as important in the remembrance of the Holocaust overall. 40 years after the end of World War II, “Shoah,” a nine-and-a-half-hour documentary, recalled stories by Holocaust survivors sans the use of archival footage. Its nearly 10-hour running time catalogues the varying perspectives from survivors, SS members and the Polish citizenry. By avoiding the use of archival footage to tell its story, “Shoah” is able to engross the viewer with the voices of the victims and participators in the camps and surrounding towns without the influence of detached imagery, while deliberately probing into eye-witnesses. What director Claude Lanzmann accomplishes is the deconstruction of the Holocaust as an abstract concept reduced to nearly incomprehensible numbers. The account is paramount as it interrogates the Polish citizenry and the survivors, depicting a continued anti-Semitism in Poland, a citizenry that seemingly allowed such a thing to occur. The experience is personal and more direct than any other Holocaust film. Controversially, “Life is Beautiful” makes light of certain elements of the Holocaust. While the film ridicules the fascist tendencies of Italy and Germany and appears to gloss over the Holocaust for the sake of a child, the film manages to find a strong character that refuses to break and remains strong for his son. The film takes place within the sphere of comedy, not necessarily poking fun at the Holocaust, per se, but finding the beauty within a world gone awry and the comedy amidst a terrible time. 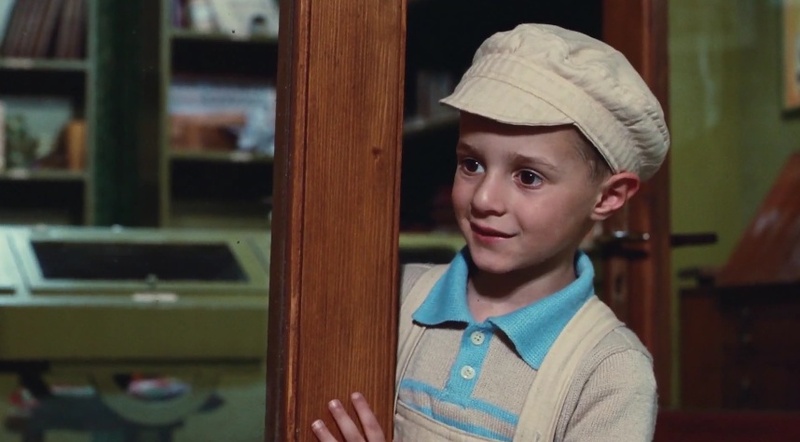 Nevertheless, the film’s tone is set in a very real atmosphere of danger for Guido (Roberto Benigni) and his boy, and part of the reason for his joyous personality is to combat the truth for his son and ultimately to save him. Guido’s comed germinates from his clownish personality, rather than being a mockery of the reality of the situation. The film refuses to focus on the dead and instead looks forward to celebrate life, despite what the obverse is capable of. By the end of the film, happiness triumphs over what has transpired; instead of focusing on the horrendous, this fictional storyopts to find a faint light amidst terrible darkness. “Paper Clips” is about a middle school in Whitwell, Tennessee that looked to the past to study tolerance at home. What the students and teachers came across was the destructive power of a hateful agenda. To the students of Whitwell Middle School, a tight-knit community, six million dead Jews was an unfathomable number and reality, so they embarked on a quest to make that number understandable through collecting paper clips. As a small town with few minorities, many of the townsfolk had never even met a Jewish person, but through the project, the students are able to better understand the implications of the Holocaust. Holocaust survivors visited the school and told their harrowing tales to the children of the school, who had only learned about the Holocaust from their books. 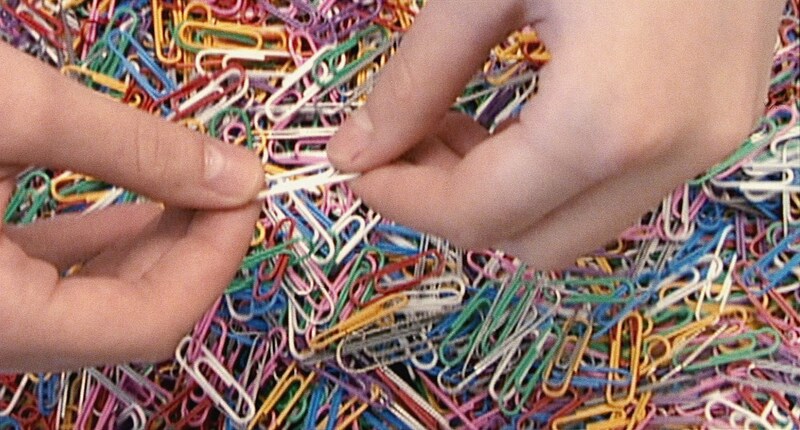 “Paper Clips” seeks to understand one of the most awful moments in world history, and looks to the future and education as a way to avert another genocide like this from happening. The film doesn’t show any of the horrendous archival footage, and instead it relies on texts and eye-witness testimonials to provide a perennial lesson that should never be forgotten. “Paper Clips” is optimistic and inspiring, promoting tolerance and implicitly placing the power of knowledge on the adult to pass on responsibly to children. It implies that through reinforced positivity and tolerance, a gateway to a more understanding future is possible.